When it comes to your picture-perfect vintage princess-cut engagement ring, you don’t mess around. The art of the princess cut goes back to the 1960s, when its distinct and glamorous aesthetic was created. Today, the style remains highly popular and coveted. You will want to give your ring some special TLC if you want to keep it sparkly and pristine at all times. To help you keep this special piece of jewelry in its original condition, we’ve put together a guide to caring for it. 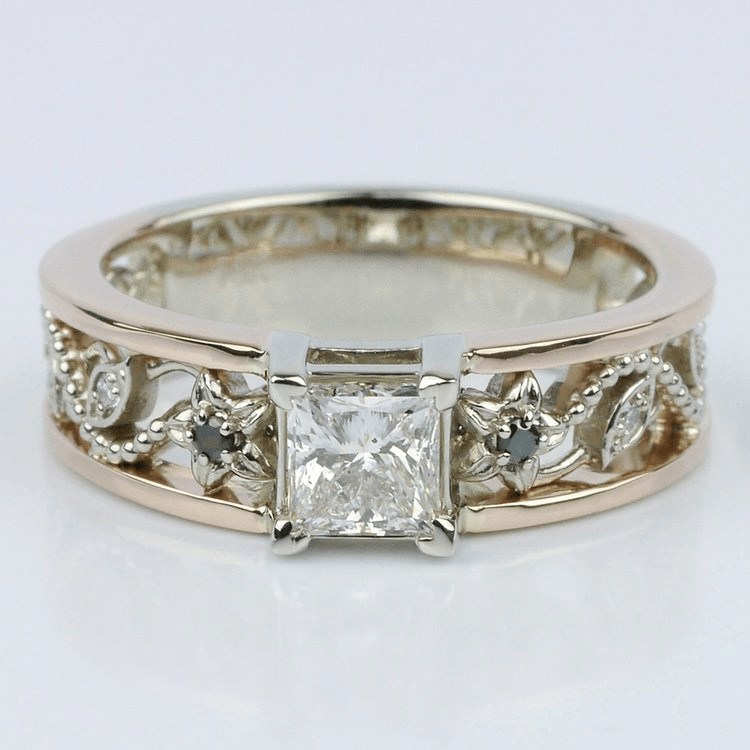 Keep reading to learn all the ins and outs of how to take care of your vintage ring. Cleaning a diamond engagement ring is actually pretty easy! First, you should use a lint-free cloth and a gentle detergent to gently buff the stone. While this motion will not scratch the diamond, it could loosen the setting, so make sure to buff gently! It’s also useful to soak your entire ring in the cleanser. Either way, ensure that you rinse the ring completely after its cleaning, and dry it fully. Detergent residue is known to dull the shine of your diamond, as well as cause skin irritation, so this is not a step to be skipped! 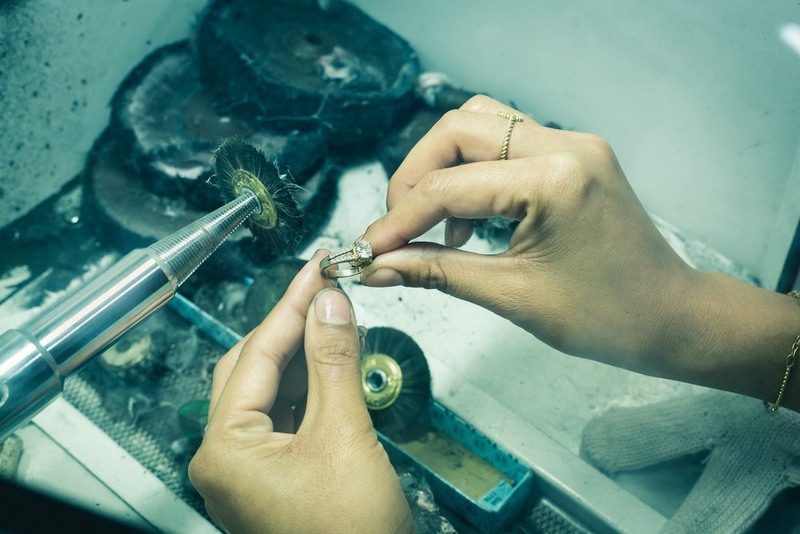 Cleaning your ring regularly is especially important for vintage rings, which oftentimes have intricate designs that leave room for dirt to sneak in and build up. Use a brush with soft bristles to clean those small, hard-to-reach spots. There are several ways to protect your vintage princess cut. After all, you don’t want to loosen the diamond from the setting or cause it to chip! Princess cut diamonds are susceptible to chips because of their blunt cut and sharp corners and edges, so it’s especially important to protect the stone. To do so, it’s useful to regularly check the prongs of your ring for damage. These prongs protect your diamond, shielding its points, corners, and sides. Prongs that are bent or broken could lead to a loose stone, which is more likely to chip. Check the prongs visually to see if they are damaged, and lightly shake the setting next to your ear listening for the clinking sound of a moving diamond. Do not put physical pressure on the prongs while checking them, as this could result in the very damage you are checking for in the first place! Another effective way to protect your diamond is to avoid exposing it to harsh chemicals. For instance, you should avoid wearing your ring when you are using household cleaning products. That means taking it off when you’re doing dishes, scrubbing your shower, or dusting. The harsh chemicals in these products can react with the metal of the setting, causing it to wear away and expose your diamond. We know that you want to show off your beautiful engagement ring, and we don’t blame you! But that doesn’t mean you shouldn’t ever take off your ring. First, don’t wear this precious accessory when you’re working out or participating in sports. Certain athletic activities put unneeded pressure on your vintage ring, which is made out of—most likely—relatively soft materials. This pressure could change the shape of your ring, which is not something you want! Even worse, it could cause the diamond to fall out and be lost in the midst of your high energy activity. Also take off your ring when putting on beauty products such as lotions or spray products. Over time, the buildup of lotion can diminish the sparkle of your ring, creating a cloudy film over it. Meanwhile, particles of perfume or hairspray can drift onto your ring and—like dust and dirt—accumulate in the crooks and crannies of the delicate details of a vintage ring. Always ensure that your hands are completely dry before slipping your ring back on that finger. Take your ring off when you’re swimming—whether it be in an ocean or a pool. Water can shrink the size of your fingers, making it easy for your ring to slip off. You definitely don’t want your ring to be washed away with a wave! Secondly, chlorine is not good for the overall health of your ring, as it can discolor the band. While taking care of your gorgeous vintage princess-cut engagement ring certainly takes a bit of work, it is definitely worth it! And these tips aren’t just for engagement rings, but for any ring featuring a princess cut diamond: anniversary rings, fashion rings, and so on. You will love flashing that beauty on your finger, and taking good care of it guarantees that it will be in mint condition for years to come—maybe even becoming a treasured family heirloom.